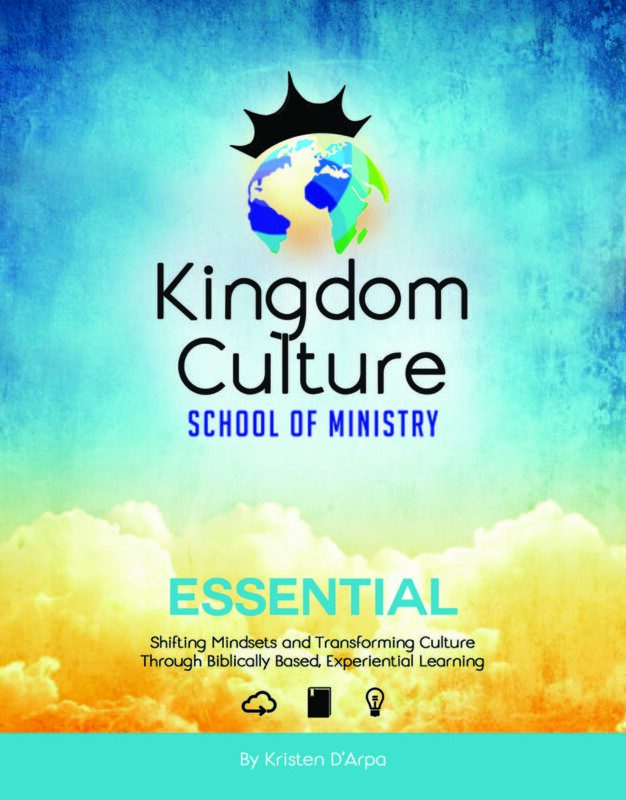 The Kingdom Culture School of Ministry is an intensive, activation-based, ministry school experience designed to root individuals in their identity, ground them in Kingdom mindsets, and equip them to confidently live a supernatural lifestyle. These manuals are designed for use in small groups, youth groups, Bible studies, ministry schools, or as a daily devotional. Each page contains a Kingdom concept with a Biblical basis, description, activation, and application. Concepts build on one another but can also be done on their own in any order. These concepts work cross-culturally for ages 10 and up. 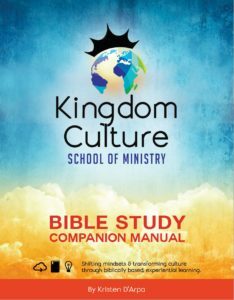 The Kingdom Culture School Manuals are available in 3 LEVELS (Essential, Core, & Complete). See more information and click on each image to order below. Check out our facebook page by clicking HERE. Kingdom Culture School Events can be live taught in 8-20 hours. These are dynamic interactive times where we gather all ages from new to mature believers and spend at least as much time “ACTIVATING” each Kingdom concept as we do sitting and listening to teaching. Please contact Kristen HERE if you’re interested in hosting a school in your area. The ESSENTIAL is the best of our Core School and includes our top twenty-five Kingdom concepts. Topics Include: Identity, Kingdom Mindsets, Inner Healing, Evangelism, Hearing God’s Voice, Physical Healing, Kingdom Creativity, and Societal Transformation. Time to Complete: 5-8 hours, in a group setting. The CORE is the best of our Complete School and includes our top seventy-five Kingdom concepts. Time to Complete: 15-20 hours, in a group setting. The COMPLETE Contains over 250 Kingdom concepts and 340 activations in every area of Kingdom living. Topics Include: Kingdom Concepts Throughout Biblical History, Kingdom Mindsets, Foundational Principles, Bible Study, Inner Healing, Evangelism, Spiritual Gifts, Hearing God’s Voice, Physical Healing, Kingdom Creativity, Societal Transformation, and More! Time to Complete: 40-80+ hours, in a group setting. Also great as an ongoing resource. Designed as a companion manual for the other Kingdom Culture Manuals, this manual teaches you how to facilitate an ongoing interactive inductive Bible study small group. It Contains: 4 inductive and 5 creative Bible study tools along with practical scheduling outlines, a 6 month Bible study planning journal and 5 foundational concepts every Bible study facilitator should be familiar with. Coming soon in English & Spanish! 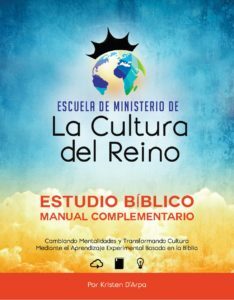 El Manual ESENCIAL de la Escuela de Ministerio de la Cultura del Reino es lo mejor de nuestra Escuela Básica e incluye los 25 conceptos más importantes del Reino. 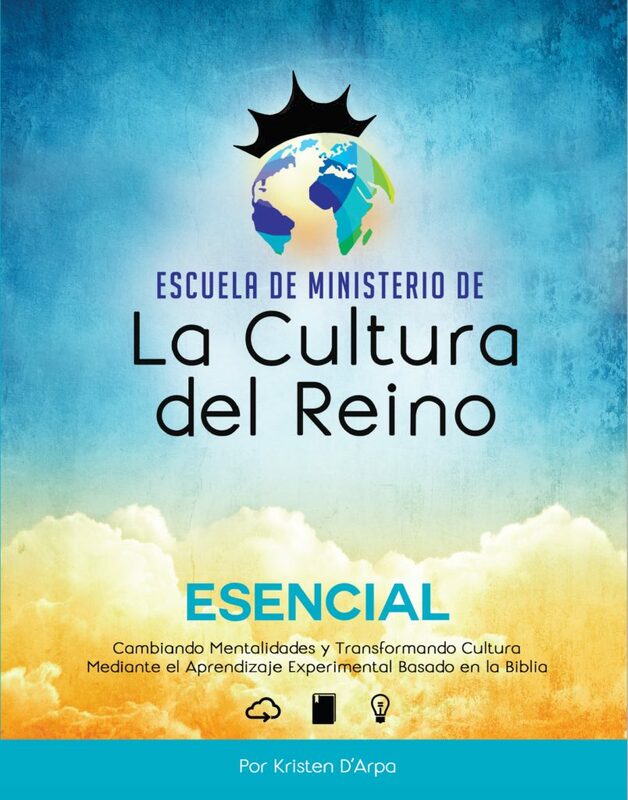 Temas Incluidos: Identidad, Mentalidades del Reino, Sanidad Interior, Evangelismo, Escuchar la Voz de Dios, Sanidad Física, Creatividad del Reino y Transformación de la Sociedad. Tiempo para Completarlo: entre 5-8 horas, en un ambiente de grupo. 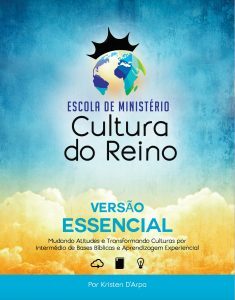 O Curso ESENCIAL da Escola de Ministério Cultura do Reino é o melhor da base da nossa escola e inclui os nossos principais conceitos do Reino. Os tópicos incluem: Identidade, Mentalidade do Reino, Cura Interior, Evangelismo, Ouvir da Voz de Deus, Cura Física, Criatividade do Reino e Transformação Social. Duração: 8 horas, em uma configuração de grupo. I am very excited to see believers across the planet being trained, equipped and activated to see the Kingdom of Heaven come to earth. There is a company of people that are responding to the heart of God to see humanity touched by His power and love. This curriculum is another one of those pieces of the puzzle to help see this take place in our lifetime. I encourage those who are hungry to learn, grow and be activated to take a look at this manual. Enjoy!! This training manual is a powerful and extensive tool to renew the mind with kingdom thinking and activate you into kingdom living. Much of what God has promised us is already accessible, and we just need to learn how to take hold of it and this manual teaches you how. It has an easy to use format that makes it accessible to anyone wanting to grow in a supernatural lifestyle. In the hands of those hungry for more of God, this manual will be a catalyst for revival. The Kingdom Culture Manual has so many tools for believers to learn about identity, ways to evangelize, and creative ways to hear from God and then bring God’s core values and lifestyle into our every day life! If you want to see the fulfillment of your supernatural potential, I would highly recommend this manual! Kristen D’Arpa is the real deal. She lives and breathes the truths within this book. This is not a collection of concepts to her, it is a lifestyle she has embraced and walks out in her daily life. It is an absolute gift to the Body of Christ to have her heart and passion for the Kingdom of God spilled out for all of us in the pages of this book. Not only can we whole-heartedly endorse the content of this book, but we can whole-hearty endorse the woman from whose heart it poured! This concise and easy to use book provides the perfect starting point for teaching and training your children all about what it means to be a son (or daughter) in His Kingdom! Across the globe God is on the move. We hear of great exploits and breakthroughs wrought by God’s children who are living testaments to the declaration, “Let Your Kingdom come, let Your will be done on earth as it is in heaven.” In these amazing times of heaven’s invasion of the earthly realm, there’s a great need for the Body of Christ to not just go after breakthroughs but to take territories for the King and establish Kingdom Culture. It is culture that sustains and expands the move of God. As the Holy Spirit progressively stirs up divine hunger in the hearts of God’s children for more, there’s a need for effective tools and trainings that will equip the believers in intentionally building a culture that would host heaven. There are emerging leaders who have learned to walk the path of honor and have served spiritual leaders and fathers who in turn, imparted to them spiritual inheritance and wisdom. These leaders are anointed and graced to equip the believers to walk in their identity and authority as children of the King. The author of this training is one of them. Kristen D’Arpa has walked the path and the process of becoming a daughter of God. I am a witness that Kingdom Culture is more than just a training module for her, she has lived life as a lover of God, freely giving what she has received in the secret place. The Kingdom Culture School is valuable for individuals, leaders and movements who are hungry to co-labor with God in transforming the earth with heaven’s reality. I highly recommend this God-breathed training to all. One of the greatest challenges in our generation is the passiveness of believers who spend years attending church and accumulating head knowledge that is hardly ever put into practice. 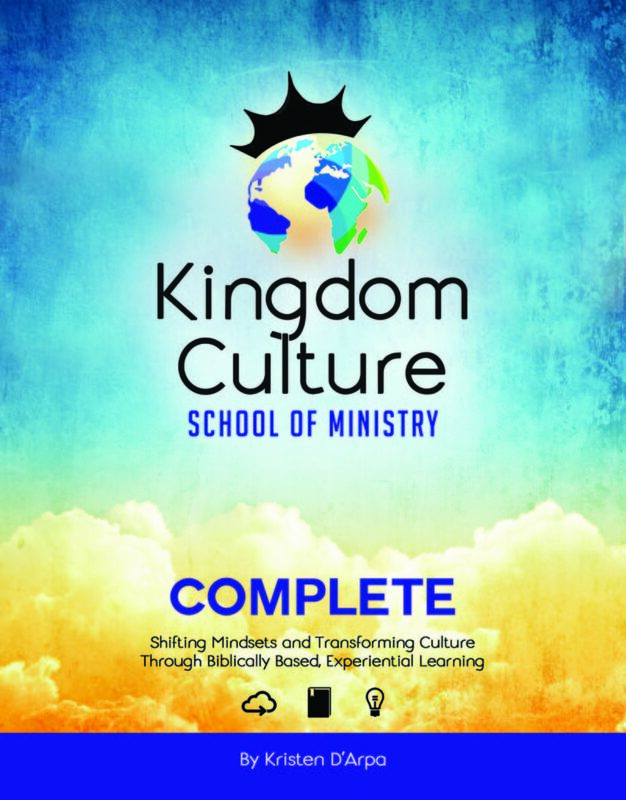 The Kingdom Culture School of Ministry pushes Christians from religious inertia into Holy Spirit action by releasing them into an adventurous faith building, life changing and God glorifying Kingdom adventure. I love it! This is an amazing approach to the age old problem of how can the church really pull the future age ( the kingdom of God) into everyday life and reality. 1 Thess. 1:5 This study was the single most helpful thing I have seen or been a part of in my whole church experience. It really was a taste and see the Lord is good. Dr. Doyal Vangelder. What can I say other than the material is so fantastic for so many people! We have used it in our classes in Bible School in Poland, Belarus, and in seminars with multi-level age groups there and in the States. The practicality of bringing the Kingdom directly into lives with practical, immediate application through the activations has been amazing. One of our translators said after the activation from The Old Man is Dead, ” I finally get it!” People are set free; Scripture pierces their hearts; there is immediate change. People love the interactions with each other over simple concepts that are suddenly borne into life in them. Such fun! We are excited that it is being translated into Polish, and our Belarussian people said they wanted it done immediately in Russian, as well. Kristen D’Arpa’s Kingdom Culture School of Ministry manuals are treasures of wisdom, forged in experience, and distilled in clear language by a very anointed and godly young woman. Wherever we are in our walk with God—newly reborn or seasoned believer—we can benefit from the many truths set forth in this manual. It’s versatile and can be so useful for group or personal study. So much is contained in these pages—even activation activities, to allow the reader to practice what is being learned. Going through these manuals will be a transformative experience. I highly recommend them and their author. Kristen had produced 3 manuals that help teachers and students to spread Revival. Kristen has captured the Lord’s heart that we walk in abundant life and feed His sheep. The activation component in each lesson, helps the learner strengthen their skills by risking and applying what they have learned. It is a tool that produces disciples of nations. Kristen has been able to distill Revival teaching and make the lessons user-friendly and practical. These manuals help the reader step right in the middle of the 1 billion soul harvest as effective ministers of the gospel. These manuals can be used at any seminary and in refugee camps and orphanages. Kristen’s manuals are equipping students and leaders to display Jesus and the Desire of Nations. Director of the Art of Peace Institute which acts for peace in the Middle East. in Bahrain, China, Mongolia, Israel, Egypt, Kuwait, Qatar, Ethiopia, Iraq, Syria, Turkey, and Dubai. Approachable and immediately applicable, the great benefit of Kingdom Culture resources is that they are immersive learning experiences. The material engages the whole person and thus becomes an opportunity for true education to take place; education that has the power to transform a person’s worldview as well as their actions. Not to mention, they’re fun! My experiences with Kingdom Culture material and the School of Ministry have been life-altering in both my personal and leadership journey. I’ve become more rooted in my God-given identity, which transforms my everyday life and relationships. I love this material because it’s grounded in truth whiled paired with application and activation. You’ll grow in knowledge while being equipped to live it out practically, creatively, and powerfully. I find myself naturally passing along these principles and activations to those around me and seeing transformation in their lives, too. It’s beautiful…and FUN! It is a genuine honor to know this Kingdom Woman of God. Every time our paths cross, Kristen imparts the love of Jesus. Last June I attended Kristen’s Kingdom Culture School. I was hungry for the “more” of God and wanted to start taking risks but didn’t know what that looked like. The 3 day training was exhilarating and scary at the same time. Through the training and application times we had, I learned to listen and hear the voice of God. This experience changed my life a quarter turn. Since taking the class. my faith is continually wanting and experiencing the “more” of the Father. I can’t say enough about this manual, it’s well written, easy to follow and able to work through all age groups. Doctors told nine-year-old Sephi that she had a broken knee cap. For several weeks she had been using crutches, wearing a leg brace and was in regular pain. During one of our sessions Jesus told her, “I’m healing your knee.” As Sephi puts it, “It got all buzzy and warm.” No one even prayed for her and, by the end of the night, she was sprinting around the church! Ten-year-old Josiah had 80% hearing loss in one ear. After receiving prayer, he went to school the next day with this note from his father informing his teachers he no longer needed to wear the school provided hearing aid (note Josiah’s penciling in of “ever again”). While at school, Josiah was able to share about his healing with his teacher, the school nurse and the superintendent, who was visiting that day. Sephi and Josiah happen to be brother and sister and their parents, Tov & Michelle, also received physical healing during that same time. According to Michelle, “This was a great experience for us as a family. It was amazing to see my children learning & experiencing the presence of God so powerfully. I know our family is changed forever because of this class!” After the school they traveled on outreach teams as a family and ministered in our area. I had a really blessed weekend at the the training. Thank you for taking the initiative to take these classes. I have gained vivid perspective and clarity with regards to what God is/was doing in my life. God had opened a door today for me to lead a colleague that I was teleworking with in Europe, into Christ. He just started sharing about his life to me which resulted in him accepting Jesus and him giving his life to Christ!! The amazing part was that I have never even met this person or even seen him. It had all happened just over the phone! One more soul for Christ! For the past three days, there have been many incidents where I was prompted and also asked to share about Jesus to others and pray for them. Most of these incidents occurred with random people as I travel and the people in my work place. It is amazing how God created all these incidents to occur such that they share their life experiences to me and then I have the opportunity to tell them about Jesus. This ministry is close to my heart and I want to see it spread like wildfire. THIS IS HEAVEN ON EARTH, THIS IS HOW GOD MEANT IT TO BE! THIS IS WHAT THE WORLD NEEDS NOW!